The tools you use can significantly impact how easy it is to get a job done and what the project looks like when it’s finished. A power drill is one of the most-used tools for a variety of projects, but a drill can only be as good as the drill bits you use with it. Our drill bit reviews in this guide will feature five of the best drill bit sets for various uses based on their quality, performance, and real reviews from customers who have used them. We've made sure that the best drill bits are found in the these sets as well. The Craftsman 100-Piece Drilling and Driving Set may be the best option for people who want the best value, with 22 black oxide-coated drill bits and plenty of helpful accessories for all kinds of projects. For various jobs around the home, the BLACK+DECKER BDA91109 Combination Accessory Set may be the most versatile, including drill bits that can work on wood, brick, plastic, and other materials. 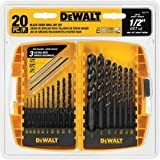 DEWALT DW1177 20-Piece Black-Oxide Metal Drill Bit Set is a compact set with bits that can withstand high temperatures and heavy-duty metals. The unique split-point design can help reduce slipping while drilling. 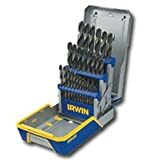 Irwin Tools Cobalt M-35 Metal Index Drill Bit Set is pricier than others but may be the best option for metal work with the steel-cobalt mixture of the bits. Even the storage case is built for tough work with its rubber molding to keep your bits protected. The Bosch BM5000 Fast Spiral Masonry Set is made specifically for concrete, brick, tile work, and other projects using the toughest materials. 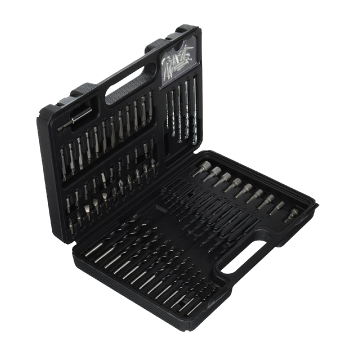 The 14-piece set has carbide tips that keep them cool and sharp. The following drill bit reviews focus on our top five picks for sets of drill bits best for most users based on customer reviews, durability, and value for the price. Each set will offer a little something different regarding the materials and projects they’re best for, so you can find the right set for your needs. This drill bit and accessory set from BLACK +DECKER may be the best option for people who want a versatile kit for working with a variety of materials with light projects. With 109 pieces, you’ll get various multi-use drill bits to use on wood, metal, plastic, and more. 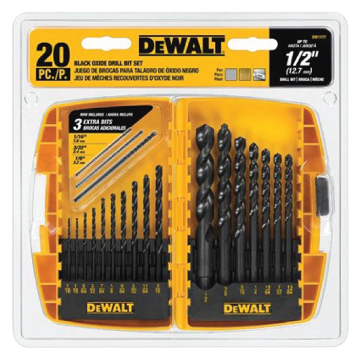 If you’re looking for a set for household projects, these drill bits may fit your needs. Most are standard steel that can hold up to light usage for thin metals and plastics and most wood projects. Every bit and accessory stores in the convenient storage case made from lightweight, hard plastic that includes a handle for portability. Customers who’ve purchased and used this set say that the case provides excellent organization for all bits and accessories and that the bits are an excellent assortment that includes most sizes they’d need for their projects. For less than $30, you can get this Craftsman set of drill and driver bits for wood, metal, masonry work, and more. The set includes 22 drill bits made from black oxide-coated steel to make them stronger than standard steel bits and to reduce the sharpening frequency. For light household projects, this set may be a good option. The hard carrying case keeps everything in one place, and its handle lets you tote the set around where you need it. One common complaint from customers is that, while the case is great for keeping everything at your fingertips, the holders inside the case don’t grasp the bits well, which can sometimes cause them to fall out of their spots. Bits sometimes fall out of storage spots inside the case. This DEWALT set may be a good option for people working with light metals. The steel bits coated in black oxide keep them a little stronger than regular bits without sending the price of the set soaring. All 20 bits have a split-point tip designed to make it easier for you to get a start on your hole and reduce the chance of the bits slipping. One of the biggest draws to this set is its excellent storage case design. It’s lightweight and compact, yet heavy-duty in its strength to offer protection to your bits inside. Some customers haven’t had much luck using these bits with wood, but those who have used them with thin metals as recommended agree that they fit snugly in a drill and cut easily through materials on slow rotations. 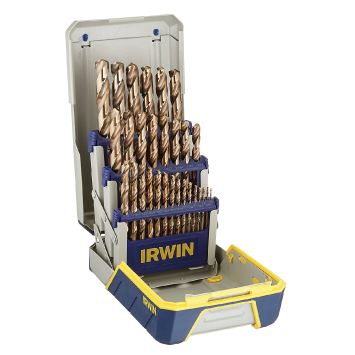 This Irwin Tools set of drill bits is best for working with light to medium metals. The bits are steel infused with 5% cobalt for extra strength and durability. The set comes with 29 bits in various sizes, with a 1/64-inch difference between each size, which gives you a lot of flexibility to find the perfect size. The bits have a split-point design to keep them from moving when you drill. One of the best features of this set is its case, which is not only lightweight and compact but also has a rubber-molded exterior to prevent damage to your bits while stored. You can store the bits in three separate compartments, each of which you can remove from the case. Several people who have bought these bits say that they do heat up fast when working with metal, so they recommend using a lubricant before you begin using them. However, many agree that these bits bite deeply into metal to cut easily without wandering from the center point. While the other bit sets in this guide can work with common materials like wood and metal, this set by Bosch is specifically designed for the toughest materials, like brick and tile. You’ll get 14 bits with carbide tips to give them the strongest start to work through heavy-duty material. These bits are durable enough to stand up to high-heat situations and fast rotations in powerful drills. The spiral design works to remove debris from ceramic, brick, and concrete holes after drilling without needing to use compressed air. A common customer complaint is about the case rather than the bits themselves. Some customers agree that the storage case has a poor design with latches that are difficult to open and made from thin plastic that can shatter easily. The best drill bits will vary based on the type of work you plan to do with them. You won’t use the same bits for quick jobs around the home as you would if you were working with heavy materials consistently. 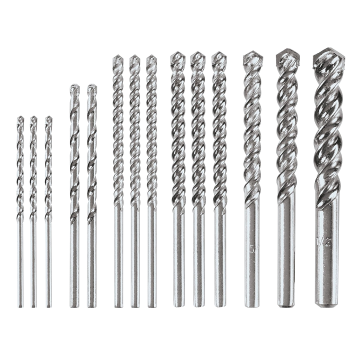 Most importantly, you’ll need to understand the different types of materials drill bits are made with and what kinds are the best for specific materials, like wood, plastic, or metal, etc. Carbon steel bits are designated as low carbon or high carbon and are the material most standard bit sets are made of. Low carbon bits are good for working with soft woods like you’ll find in most simple household projects, while high carbon bits are better for hardwoods and thin metals, as they can typically withstand higher temperatures. One of the most popular types of bits is the High-Speed Steel (HSS) bit, which manufacturers make from high carbon steel meant to withstand high temperatures and fast rotations. When looking for the best hss drill bits, these are good for most hardwoods and light to mid-weight metals. Carbide and cobalt bits are usually for heavy-duty metalworking projects. These bits are incredibly strong and durable, and they tolerate heat well. There are also several types of coated bits that can make standard steel bits stronger, more heat-resistant, and even longer-lasting than they’d be normally. Black oxide and titanium coatings are among the most common. One of the things you purchase when you buy the best drill bits set is convenience. Sets will usually come in some type of carrying case or bag that not only organizes and stores the bits but also makes it easy for you to transport them where you need them. Not all storage cases are equal, though. Depending on what type of projects you work on and where you tend to work most, a soft carrying case may not be the best option. Soft cases are usually lighter than hard cases, but they also may not give you the best organization options or last as long as a hard case. Consider finding a bit set that has not just the right bits, but also offers convenient storage and carrying options that can increase the life of your bits and make it easy for you to bring them with you. High-speed and coated drill bits will cost you more than standard drill bits, but you won’t always need to pay for the highest quality bits if you don’t have projects that need them. Sticking to your budget is as important as getting the right bits for the job. 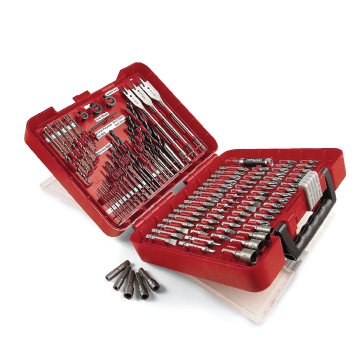 Top rated drill bit sets can come in as little as five bits to as many as 100 bits or more. A 25-bit set may seem like an excellent value because you’ll get several different sizes, but if it includes several low-quality bits that will wear down after a year, it’s not the best value. 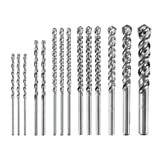 Pay attention to the drill bit sizes that come in each set and weigh the number of bits and their quality against your budget and needs to determine if it’s really the best value for you. The drill bit set you choose will, of course, be one that makes the most sense for the needs of your usual projects. Our choice for the most versatile set of drill bit sets that most people can benefit from is the BLACK+DECKER BDA91109 Combination Accessory Set. This set not only has drill bits that can help you complete various everyday projects, but it also includes several accessories to make the average homeowner’s job easier. The portable carrying case keeps everything inside protected and portable. Whether you need a woodworking drill bit set or one that cuts through brick, we’ve offered a helpful mix of options in our reviews. We hope this guide leads you to find the best drill bits and best drill bit sets for your needs. Cobalt Drill Bits vs Titanium Drill Bits: What Material is the Better Choice?